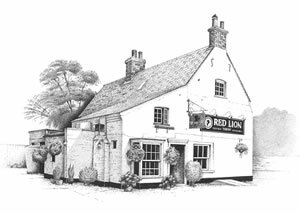 The Red Lion is a traditional country pub that has been in the village for many years and is valued by the community. There is an entire wall dedicated to old photos of the pub and the village dating back to the early 1900's. Opposite this is the open fire place which is always roaring in the winter months. The building is full of character and the atmosphere is comfortable and friendly. All the meals on the menu are cooked from scratch using fresh ingredients. There is also an allotment next to the beer garden and the produce from this will often feature on the specials board. As The Red Lion is a freehouse the beers change from week to week which is great for beer connoisseurs. The Red Lion was also named 'Best Local Pub' in Morrisons Magazine 'Great Grub Awards 2013'.